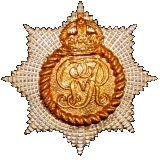 Officers of The RCR (CEF) - Lieutenant M.F. Gregg, V.C., M.C. » Lieutenant M.F. Gregg, V.C., M.C. Lieut. Milton Fowler Gregg, V.C., M.C. 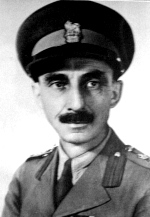 Brigadier M.F. Gregg, V.C., M.C. 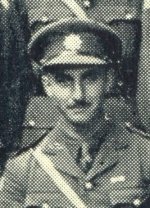 (Colonel of the Regiment, The RCR). Image of photo in The RCR Museum. 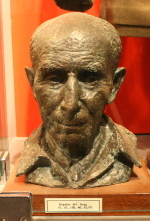 Bust of Milton Gregg, in The RCR Museum. 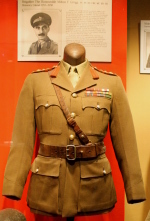 An officers' service dress tunic worn by Brigadier Gregg, on display in The RCR Museum. SUPPLEMENT TO THE LONDON GAZETTE, 29 JANUARY, 1917; General List. - 2nd Lt. M. F. Gregg, from R. Lanc. R., to be temp. Lt. 1 Nov. 1916. April 1946; Appointed Honorary Aide-de-Camp to the Governor General (The Viscount Alexander of Tunis, KG, PC, PC, GCB, OM, GCMG, CSI, DSO, MC, CD). Elected to Parliament, Liberal Member for the riding of York-Sunbury, New Bruswick, from 1947 until 1957. Stolen Victoria Cross - Milton Gregg's Victoria Cross medal group and orders were stolen on 24 December 1978 from the Royal Canadian Regiment Museum, London, Ontario. The VC and his other medals have never been recovered. Lt. Milton Fowler Gregg, Infy. - For conspicuous gallantry and devotion to duty in leading a bombing attack against a hostile machine-gun, which he outflanked, and annihilated the crew, thus permitting the advance of his party to continue unchecked. His prompt action greatly assisted the success of a much larger operation. Later, although himself wounded, he carried a seriously wounded officer out of action to a place of safety. Lt. Milton Fowler Gregg, M.C., R. Can. Regt., Nova Scotia R. - For most conspicuous bravery and initiative during operations near Cambrai, 27th September to 1st October, 1918. 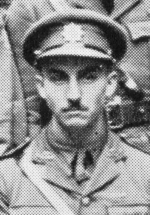 On 28th September, when.the advance of the brigade was held up by fire from, both flanks and by thick, uncut wire, he crawled forWard alone and explored the wire until he found a small gap, through which he subsequently led his men, and forced an entry into the enemy trench. The enemy counter-attacked in force, and, through lack of bombs, the situation became critical. Although wounded, Lt. Gregg returned alone under terrific fire and collected a further supply. Then rejoining his party, which by this time was much reduced in numbers, and, in spite of a second wound, he reorganised his men and led them with the greatest determination against the enemy trenches, which he finally cleared. He personally killed or wounded 11 of the enemy and took 25 prisoners, in addition to 12 machine guns captured in this trench. Remaining with his company in spite of wounds, he again on the 30th September led his men in attack until severely wounded. The outstanding valour of this officer saved many casualties and enabled the advance to continue. For his services to Canada as a soldier, and public servant. GREGG. Maj, Milton Fowler, V.C. ; Dominion public service; b Mountain Dale, N.B., 10 Apl. 1892; s George Lord and Elizabeth Celia (Myles) G., both Candns. ; e pub. sen.. Mountain Dale, N.B. ; Prov. Normal Sch.,I Predericton, N.B. ; Acadia Univ., Wolfville, N.S., M.A.-1920; m Amy Dorothy d Fred H. Alward, Havelock, N.B., 25 Aug. 1919; one d Eleanor Jean; SERGEANT-AT-ARMS, HOUSE OF COMMONS, OTTAWA, since 1984; was formerly a dir. of Internat. Diatomite Industs. Ltd. at Digby Neck and Colchester Co., N.B., and pres., Gregg Motors Ltd.. Halifax; taught sch. in N.B., 1910-12; has had a wide experience in advertising, and was engaged in this work with Casino Theatre, Halifax and Halifax Herald; pte., Princess Louise 8th Hussars, Sussex, N.B., 1910; qualified as cadet instr., 1911; served in World War 1914-18 with distinction; joined 18th Bn. 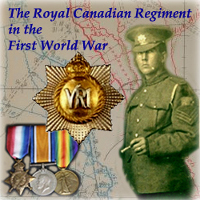 R.H.C., C.E.F., 1914; wounded with 13th Bn., 1915; granted comn., 1916; served as 2nd lieut with King's Own, Roy. Lanes. Regt; trans, to Roy. Candn. Regt. ; with them wounded twice; awarded "V.C., M.C. and bar; promoted adjt. ; has since been in Candn. Mil. ; was bgde. maj., 16th Inf. Bgde., N.B., and is now maj., Gov. Gen's. Foot Guards, Ottawa; holds Mons Star [sic] and service medals; awarded King's Jubilee Medal, 1935; during Prince of Wales celebration in London, 1929, for Empire V.C's, wrote articles on the various events which were publ. in Saint John Telegraph Journal and Halifax Herald; has written sundry papers and addresses on ex-soldier's problems and the work of the Candn. Legion; pom. treas., Candn. Legion; mem., Brit. Empire Service League; Baptist; recreations fishing, hunting, riding; Home 632 Rideau St, Ottawa, Ont. GREGG, Brig. the Hon. Milton Fowler, P.C. (Can. ), C.B.E. (1944), V.C. ; legislator; teacher; b. Mountain Dale, N.B. 10 Apr. 1892; s. George Lord and Elizabeth Celia (Myles) G., both Candns. ; e. pub. sch., Mountain Dale, N.B. ; Provo Normal Sch., Fredericton, N.B. ; Acadia Univ. M.A. 1920, hon. D.C.L. ; Univ. of N.B. ; hon. LL.D. ; m. Amy Dorothy, d. Fred H. Alward, Havelock, N.B. 25 Aug. 1919; one d. Eleanor Jean; taught sch. in N.B. 1910-12; had wide experience in advertising. and was engaged in this work with Casino Theatre, Halifax and Halifax "Herald"; pte., Princess Louise 8th Hussars, Sussex, N.B. 1910; qualified as cadet instr., 1911; served in World War 1914-18 with distinction; joined 13th Bn.. R.H.C., C.E.F. 1914; wounded with 13th Bn. 1915; granted comn. 1916; served as 2nd lieut. with King's Own, Roy. Lancs. Regt. ; trans. to Roy. Candn. Regt. ; with them wounded twice; awarded V.C. for penetrating the Hindenburg Line at Cambrai single-handed; M.C. and bar; promoted adjt. ; has since been in Candn. Mil. ; was bde. maj., 16th Inf. Bde., N.B., and is now maj., Gov.-Gen's. Foot Guards, Ottawa; holds Mons Star [sic] and service medals; awarded King's Jubilee Medal 1935 and Coronation Medal 1937; Sgt.-at-Arms, H. of C., Ottawa 1934-39; served in World War 1939-44; proceeded overseas as 2nd in charge, Roy. Candn. Regt. ; commanded West N.S. Regt. overseas; commandant, Offrs. Training Centres; promoted brig. ; retired from Army 1944; pres., Univ. of N. Brunswick 1944-47; sworn of the P.C. and apptd. Min. of Fisheries in govt of Rt. Hon. W. L. M. King, Oct. 1947; 1st el. to H. of C. for York-Sunbury at by-el. 20 Oct. 1947; has written sundry papers and addresses on ex-soldier's problems and the work of the Candn. Legion; Dom. treas., Candn. Legion; mem., B.E.S.L. ; Liberal; Baptist; recreations: fishing, hunting, riding; Address: Parliament Bldgs., Ottawa, Ont. 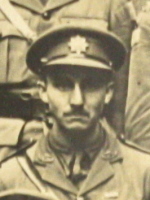 Born in New Brunswick, Brigadier Gregg enlisted as a private soldier to go overseas in 1914. He saw service in Europe with the Black Watch in 1915 and was wounded at the Battle of Festubert. Commissioned in 1916, he joined The Regiment as a reinforcement officer in 1917. 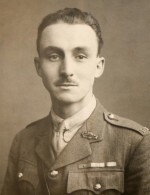 Twice wounded, he was awarded the Military Cross and Bar before winning the Victoria Cross during the Battle of Cambrai. On rejoining The Regiment, he served as Acting Adjutant after the Armistice, returning to Canada in 1919 with The Regiment for demobilization. Active in the Militia in the years between the wars, he rejoined The Regiment as Second-in-Command in 1939 to go overseas again. 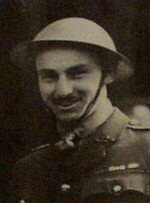 In 1940 he left the unit to command the West Nova Scotia Regiment. In 1941 he began a third career, that of training officers wherein he developed the Battle Drill School at Vernon, B.C., and subsequently trained the CAN LOAN officers at Sussex, N.B. President of the University of New Brunswick at the end of the war, he stood for election to the House of Commons in 1947. On election, he filled successively three Cabinet posts; those of Fisheries, Veterans' Affairs, and Labour. Subsequent to his political career, he served with the United Nations in the Middle East and Indonesia from 1958 to 1963. His most recent appointment has been to represent Canada abroad firstly as the representative to British Guiana and then as the first Canadian High Commissioner to the new state of Guyana. Now retired, he lives in Sussex, N.B. GREGG, Brig, the Hon. Milton Fowler, V.C., PC. (Can.) 1949, O.C. 1967, C.B.E., M.C., M.A., D.C.L., LL.D. ; b. Mountain Dale, N.B., 10 Apl. 1892; s. Geo. Lord and Elizabeth Celia (Myles) G.; e. Prov. Normal School, Fredericton, N.B. ; Acadia Univ., M.A. 1920, D.C.L. ; Univ., N.B. and Dalhousie, LL.D. ; m. Amy Dorothy, d. Fred H. Alward, Havelock, N.B., 25 Aug. 1919; has d., Eleanor Jean; taught sch. in N.B. 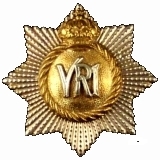 1910-12; served in World War 1914-18, with distinction; joined 13th Bn. R.H.C., C.E.F., 1914; wounded with 13th Bn. 1915; granted comn. 1916; served as 2nd Lieut, with King's Own Roy. Lanes. Regt. ; trans, to Roy. Candn. Regt. ; with them wounded twice; awarded V.C. ; M.C. and Bar; promoted Adj. ; after 1st World War continued in N.P.A.M. and sometime Bdge. Maj., 16th Inf. Bgde. ; awarded King's Jubilee Medal 1935, and Coronation Medal 1937; Sgt.-at-Arms, H. of C., Ottawa 1934-39; served in World War 1939-44; proceeded overseas as 2nd in Commnd. Roy Candn. Regt. ; commanded West N.S. Regt. overseas; Commandant, Offrs. Training Centers; promoted Brig. ; retired from Army 1944. Pres., Univ. of New Brunswick 1944-47; sworn of the P.C. and apptd. Min. of Fisheries in King Govt., Oct. 1947; Min. of Veterans' Affairs, 1948-50; Min. of Labour, 1950-57; 1st el. to H. of C. for York-Sunbury at by-el. 20 Oct. 1947; re-el. in g.e. 1949 and 1953; def. in g.e. 1957; formerly Dom. Treas., Candn. Legion, B.E.S.L. ; sometime U.N. Rep. in Iraq; apptd. Warden of Medway Hall, Univ. of W. Ont., 1959; apptd. Resident Rep. of U.N. Children's Fund in Indonesia, 1960; Commr. for Canada in British Guiana, Jan. 1964; re-married to Erica, widow of Kjeld Deichmann, 22 July 1964; retired 1968; Pres., Candn. Council for Internat. Cooperation, Ottawa 1968-71; Liberal; Baptist; recreation: fishing; Address: Thorn Cottage, R.R. 3, Fredericton, N.B. 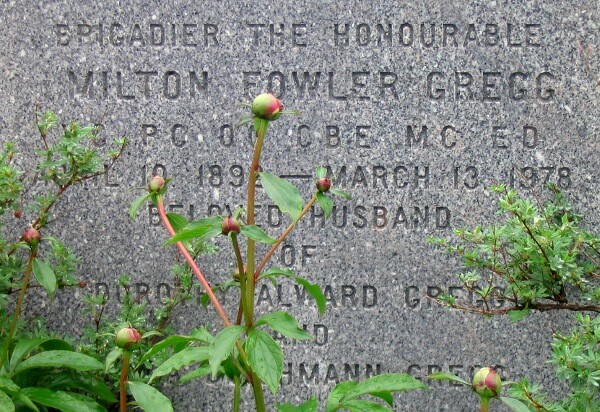 "Milton Fowler Gregg, VC, PC, OC, CBE, MC, ED, CD (1892 - 1978) was a Canadian officer, and recipient of the Victoria Cross, during the First World War. In later life, he was a Member of the Canadian Parliament, cabinet minister, academic, soldier, diplomat." as displayed in The Royal Canadian Regiment Museum.